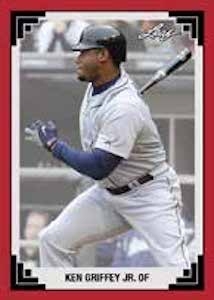 2017 Leaf Best of Baseball is another in a long line of popular buyback products from the card company. Each box promises one repurchased card along with one 1991 throwback card. As with previous Leaf Best of Baseball products, there is not a base set nor is there likely to be a final checklist. However, 2017 Leaf Best of Baseball offers collectors an opportunity to pull an impressive lineup of current, retired, and Hall of Fame players such as Bryce Harper, Cal Ripken Jr., Derek Jeter, Joe DiMaggio, Ken Griffey Jr., Mickey Mantle, Nolan Ryan, and Sandy Koufax. 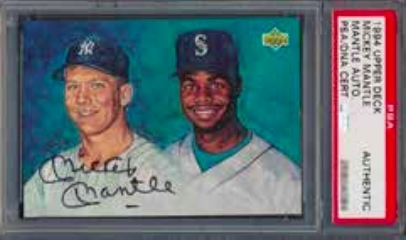 The buyback options include notable choices like rookie cards, vintage releases and hits such as relics and autograph cards. Many of the vintage and rookie buybacks are professionally graded. 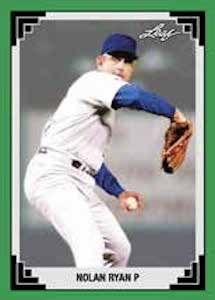 In addition to the previously produced baseball cards, 2017 Leaf Best of Baseball also includes one 1991 Acetate Throwback card in every box. The cards feature a design familiar to Leaf baseball collectors with a solid color border and the stacked triangles in each corner. These new cards cover legendary ballplayers including Ripken, Griffey, and Nolan Ryan. 21 cards. 1 per box. PARALLEL CARDS: Blue #/35, Purple #/25, Green #/10, Red #/5, Gold 1/1.